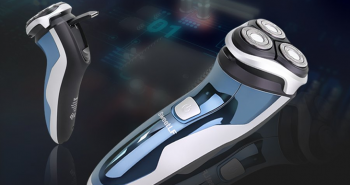 Are you looking for the best electric shaver on the market in 2019? Then this is the place for you! We work hard together with our experts to manually test and review each shaver, so that you can find the one that suits you the best. We categorise each shaver and analyse all the information about them thoroughly. 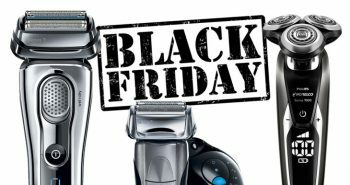 This way we can provide you with a list of the top shavers Today. You also have the chance to compare electric shavers based on their features and find the one that will provide you with the best shaving experience. 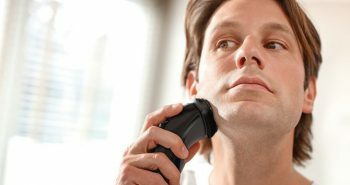 The electric shaver has long been one of the top choices for men when it came to shave away excess facial hair. The reason for this is probably the efficiency and versatility of this kind of shaver. Electric shavers have been around for nearly 100 years and since then they have come a long way. 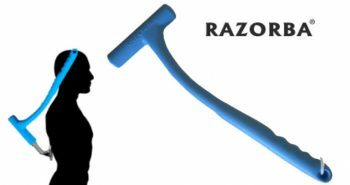 The first electric razor was patented by Colonel Jacob Schick, back in 1928, with a long cord for plugging into the wall. Since then the electric shaver has evolved into a compact cordless unit that can be automatically charged with a battery pack. There are models which you can use in the shower or that you can comfortably take with you on a vacation. If you are looking for expertly written shaver reviews about electric shavers that had been tested by professionals, then you are in the right place. We test, analyse and review so that you can find the best electric shaver Today! 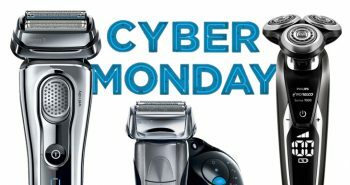 In our electric shaver reviews we’ll discuss which one is the best electric shaver on the current market for the holiday season. So watch this space for the best Black Friday and Cyber Monday deals for potential Christmas presents! 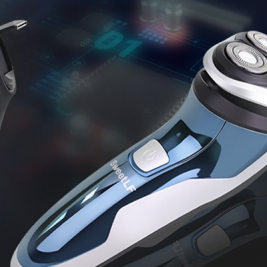 If you are looking for the best electric shaver no need to look any further. The Braun Series 9-9095cc Wet and Dry Foil Shaver comes in a shiny silver metal foil-style shaver, with a black cleaning centre that makes the chore of maintenance much simpler. Built within the foil-style shaving head are four rows of cutters, with blades encased within each one. The two central ones are cutting combs, while the two on either side are foils with slots that capture the normal, coarse, or flat-laying hairs before snipping them off. 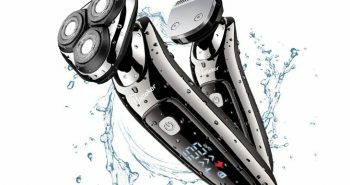 The shaver has been built with Syncrosonic technology that enables it to deliver powerful 40,000 cross-cutting actions per minute, without pulling or nicking the skin. This lessens the time for shaving and minimizes the potential for redness or razor burn. This shaver has an LED status readout beneath the main power button. The shaver has been designed to be ergonomic and comfortable to hold in the hands. 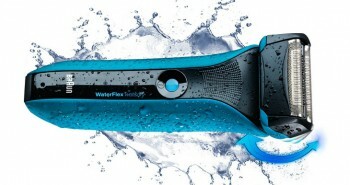 The shaver can be used wet or dry, and is fully washable. 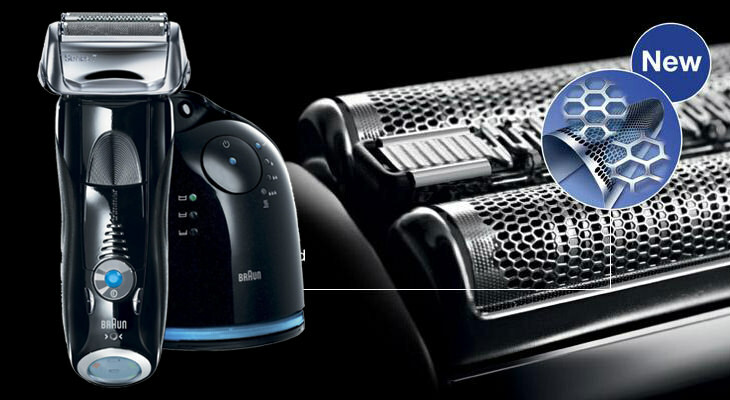 The cleaning centre will keep the Braun shaver in excellent functioning order. It can be used once a day or once a week, and can be manually rinsed out each morning. The cleaning centre will hygienically clean, charge, dry, and lubricate the shaver, making it new every time. It takes only a touch of the button to start the process, and will always keep your shaver feeling comfortable on the skin. The built-in fan ensures the shaver is perfectly dry before charging it up. The unit takes a 5-action alcohol-based cartridge. Each Braun Series 9 9095cc box contains one shaver, one cleaning and charging unit, one cleaning cartridge, an electric cord, and a convenient travel case. 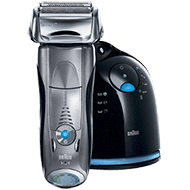 The Braun Series 7-790cc Pulsonic Men’s Shaving System has some neat features so you can customize your shaving experience. The Braun Pulsonic has what Braun is calling “Pulsonic Technology” that consists of 10,000 micro vibrations that promise to remove more hair with each stroke, and to do it quickly. Best of all, for what this shaver offers, it’s available for a really affordable price. 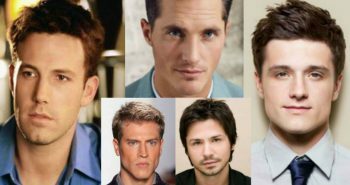 Every man’s facial skin is different. 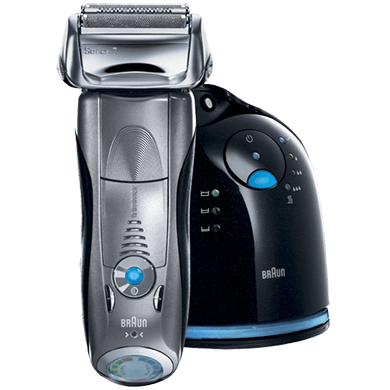 The Braun Pulsonic comes with three different settings, so you customize the shave to your liking and type of skin surface, from sensitive to normal to intensive. Their “fully flexible shaving system” promises to adapt to your facial skin type. The contour-adaptive shaving head will quickly adjust to the nooks and crannies of your face, including jaw line, and under the chin, so no hairs are missed. 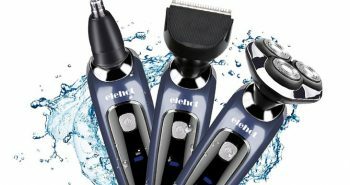 Another advanced feature that is handy is “ActiveLift” that can grab flat-lying hair against the skin, and raise them up, so the shaver can easily shave them out. The Pulsonic is built with an extremely powerful motor, that will get the job done. ActiveLift is a patented cutter that fits in the middle of the shaving head, to get difficult hairs out. No question this is one of the best electric shaver available today. It’s super easy to clean this electric shaver when you use the combination cleaner, lubricator, and portable charging unit. There’s no need for you to dig in the corners with a tiny brush when all you have to do is place your shaver back in the combination cleaning and charging unit, and it’ll do everything for you with the simple press of a button. There’s no need to stand at the sink trying to scrub tiny hairs out, when the cleaning unit will do it all for you, with the simple press of a button. What’s so great about this shaver is that you can leave it to clean itself, without having to pull it out of the cleaning unit to transfer to another charging unit. Simply store it in its rest, and the next morning it will be ready to go again. There’s even a five minute fast clean, for men in a rush, or for those who forgot to clean it the day before. One feature that isn’t too common with other electric chargers in the same class is a quick five minute charge option. Too many times the charge can run down in your electric shaver, leaving you stuck in the morning. But leaving the house isn’t a good option when you have a special meeting to attend. The Braun Pulsonic can be quickly charged up in five minutes, so you can have a clean shave before you have to get to your meeting. The five minute charge will provide you with up to fifty minutes of cordless shaving time. There’s not many other electric shavers that can offer such a speedy charging time. The Li-Ion battery does not suffer from the memory-effect of repeated charges, so it’ll retain a full charge each and every time. Each Braun Pulsonic Shaver box contains one shaver, one cleaning and charging unit, one cleaning cartridge, an electric cord, and a convenient travel case. 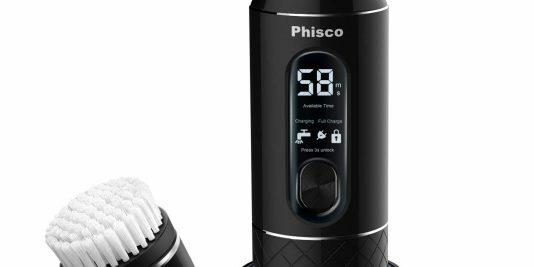 The Philips Norelco Electric Shaver 9700 S9721/87 is a sleek black and silver rotary-style shaver that comes with a cleaning and charging unit. 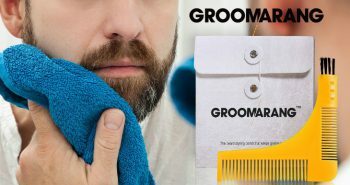 Both of these items have some great features that will make personal grooming for men much simpler in the morning. 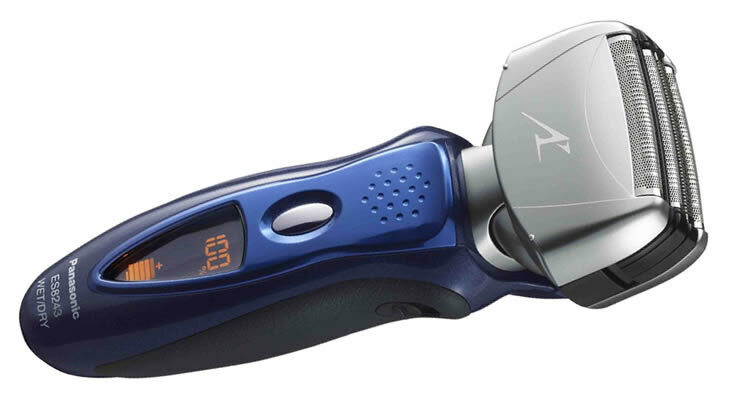 The Shaver 9700 has a flex head that moves in eight different directions. This enables it to trim 20% more hairs than a comparable product without flex. There are V-track precision blades within the rotary head that are installed at an optimal cutting angle. The shaver can be used wet or dry, with shaving products or not. 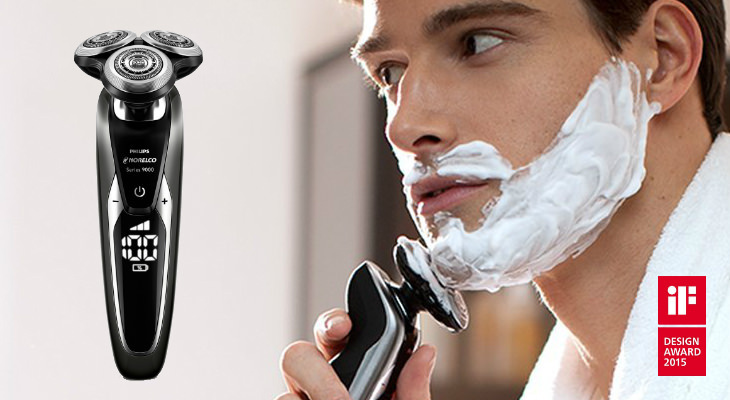 The blades within the rotary head will shave 30% closer, but still provide a comfortable shave. The cleaning and charging station comes in a matching black colour. The shaver fits head side down and will clean, lubricate, dry, and charge your shaver. There are multiple speed settings for men to choose their optimum skin or hair type. There is slow for a safe shave, medium for a more thorough shave, and fast for a fast high-powered shave. The shaver also has an LED readout screen that automatically lights up. It will indicate the battery level, the cleaning status when it’s in the cleaning and charging unit, and has a low battery indicator. There is also a SmartClick precision hair trimmer, shaver carrying case, and cleaning cartridge with the kit. The Panasonic ES-LV81-K is one of the line’s more unique-looking shavers today. This model in particular has won design awards. 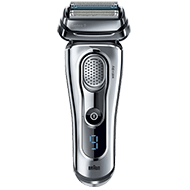 It features an electric rechargeable shaver in a black finish, with silver power button and five rows of foil-style cutters. In the kit is also a cleaning and charging station in attractive silver and black design, with an LED progress indicator. 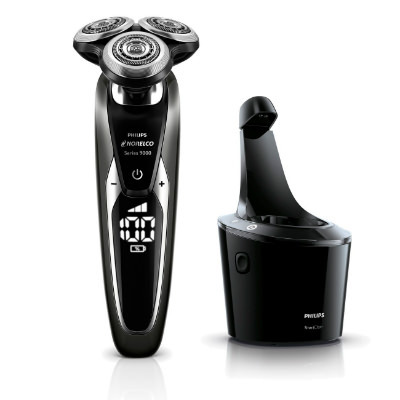 This Panasonic shaver can be used wet or dry, to provide a clean smooth shave. The foil head is on a multi-flex system, so it can move around. The pivoting head also makes it easier for the shaver to glide around your face without wearing out your hand from having to push it around. Inside the shaver head are extremely sharp blades that can been installed at 30 degree angles. These blades are also made by hypoallergenic stainless steel metal for maximum comfort. There is a Lift-Tech foil system that makes your shave incredibly close. 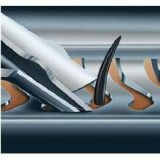 Some shavers only have three or four rows of cutting foils, but the Panasonic ES-LV81-K has an amazing fifth cutting element. All of these work together to cut and trim off even the most stubborn flat-lying hairs. In the centre is a quick-comb blade that is designed to catch those longer hairs, so if you haven’t shaved for a few days don’t worry, your Panasonic shaver has got it covered. This shaver had been built with a Hyper Performance linear motor. This fast motor enables it to deliver 14,000 cuts per minute, or 70,000 cross-cutting actions per minute. This results in a quicker and smoother shave on both face, jaw, and neck. The shaver will nicely conform to the curves and angles of your face. The automatic cleaning and drying system makes maintenance simple. Simply place your shaver head down into the unit and press the button. Your shaver will automatically be cleaned, dried, and charged up. It’ll then be ready for your shave next morning. If you want to skip using the station, you can simply rinse your shaver under the tap for the next day. 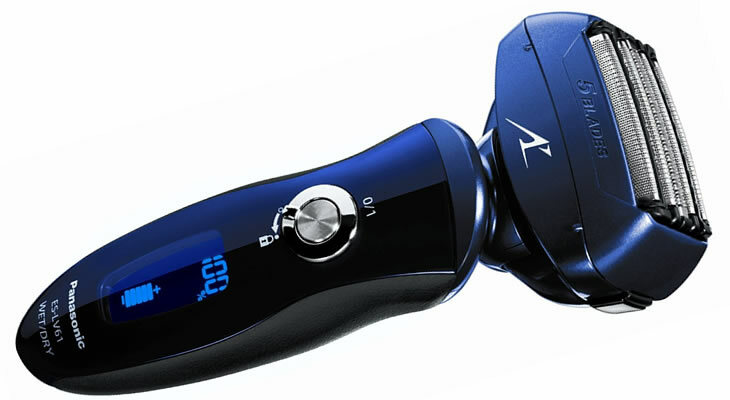 There are many great features packed into the ES-LV81 Arc5 shaver. 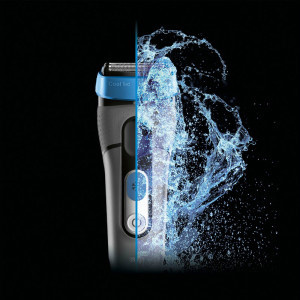 The shaver has a ten stage LCD panel so you can check it quickly to see if you have enough power, or you need to get it charged up for the next day. This panel displays 10 different stages, as well as battery status and charge levels. There is also a cleaning reminder in case you have forgotten to clean your shaver. There are also extras with this shaver. At the back is a pop-up trimmer which will do those small and tight regions around your face. You’ll be able to trim sideburns, moustache, and short beards easily. Inside your Panasonic ES-LV81-K box you’ll get one shaver, a travel pouch, and the clean and and charge station. 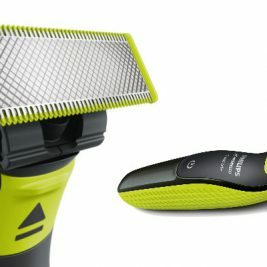 If you’re searching for the best electric shaver from the Panasonic line that has a sleek and unique design, the Panasonic ES-LV81-K men’s electric razor may be exactly what you want. 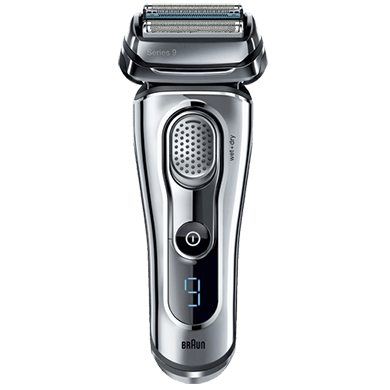 The Braun Series 7 760cc-4 is an electric foil shaving shaving system that Braun promises will shave off in one stroke what other shavers do in two. 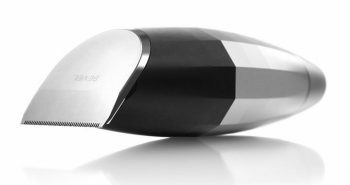 It features an electric cordless and rechargeable shaver in shiny black and silver, with a black clean and charge station. The front of the shaver has a power on button at the bottom, with two small switches, and a battery status LED indicator at the base. This electric shaver has a flex head, so it can move in all directions. This head pivots, and with its MicroMotion technology it will allow the shaver to contour to the unique contours of your face. This also gives it better skin contact, so your shave is achieved more quickly. The foils are fully synergized so they all work together to effectively remove hair from face and neck. An ActiveLift trimmer at the top of the foil head also captures stubborn hairs that may lay flat against the face. This is particularly effective along the chin and neck regions. The Optifoil can trim hairs that are shorter than 0.05 millimetres so you can have an extremely close yet comfortable shave. The intelligent sonic technology will automatically speed up when it reaches a particularly dense region of hair. It can speed up to 10,000 micro-vibrations per minute in its most powerful phase. This shaver is also 100% waterproof so you can choose to shave dry or wet. Use it under running tap water, or take it into the bath or shower with you. If you don’t want to use the clean and charge station you can simply rinse it out under the tap. This is an important step, should you decide to add shaving gels or creams to your routine. There are three different shaving modes to choose from. 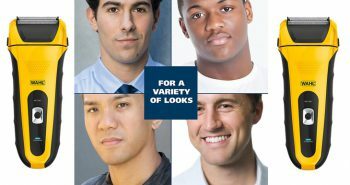 You can choose based on your skin type or thickness of hair. There is extra-sensitive to intense. The Clean and Charge station is more advanced than other manufacturers’ cleaners. This is the only 5-action cleaning station on the market. It takes alcohol-based cleaning cartridges that get your shaver head much cleaner than simply using water. Your station will first clean the shaver, then lubricate and dry it. Finally, it will charge it up. Simply place the shaver head down in the unit and press the button. There is also a power cord that can be used to charge up the shaver should you not wish to pack the cleaning station for travel. 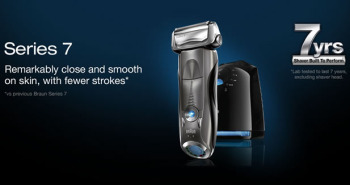 This shaver has a guarantee that promises it will work every day for you, up to seven years. Inside the box you’ll receive one Braun Series 7 760cc-4 shaver, the clean and charge station, a storage case, power cord, and a cleaning brush. 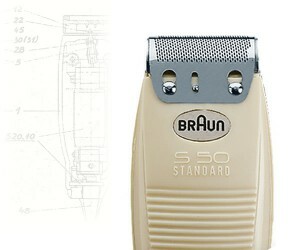 The Braun Series 7 is more efficient than any rotary shaver and will deliver a safe and smooth shave. 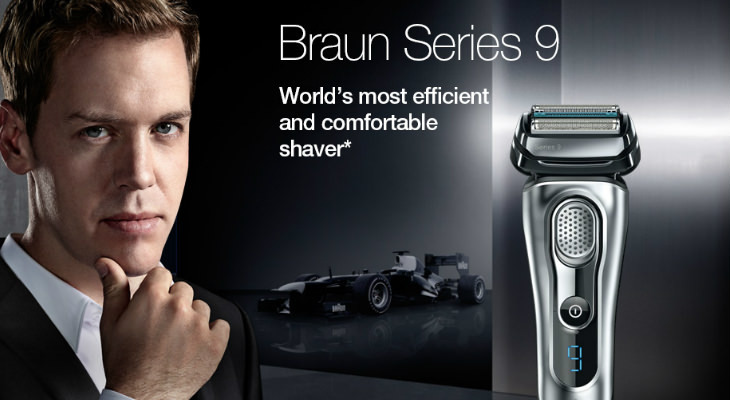 If you’re seeking an efficient and superior shave, the Braun Series 7 760cc-4 shaving system can deliver. 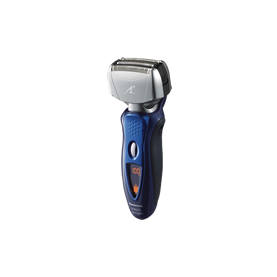 Unfortunately the Panasonic ES-LV61 dropped to the #6 position in my list, but it is still a great shaver. 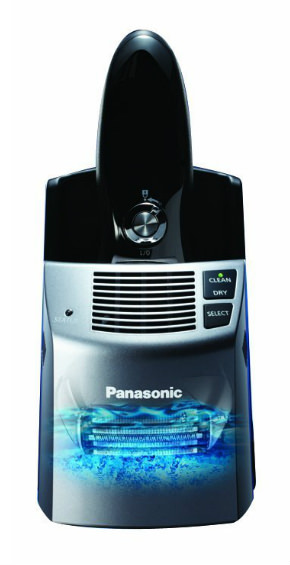 The Panasonic ES-LV61-A Arc5 Men’s Electric Shaver can be used either wet or dry, and has a multi-flex pivoting head. If you’re seeking for one of the best electric shaver that’s actually been Made in Japan, then this may be the one for you, though you’ll pay for that privilege. This shaver features a five blade vibrating foil system, with nano blades that promise the best shave ever. The head of the shaver can pivot around, so you can reach all the hard spots, adjusting to your facial structure. The pivoting head allows the shaver to glide smoothly over the skin, cutting hair away with each clean sweep. Each blade is arranged in 30 degree angles so they can cut the hair cleanly off near the roots. 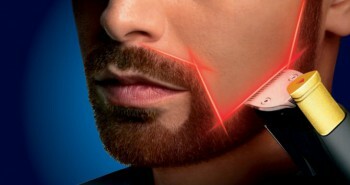 Many shavers are only designed for removing hair from a man’s face, but the Panasonic Multi-Flex shaver is also suitable for trimming beards, because even men with long beards need to do grooming too. This electric shaver comes with three different types of foils: lift-tech, slit, and finishing, that are designed to trim long beards. For those with sensitive skin, Panasonic has taken great care in creating special blades and foils to trim a man’s facial hair, without causing a lot of irritation or discomfort. A fast linear motor trim quickly and easily, eliminates dragging and painful tugging. 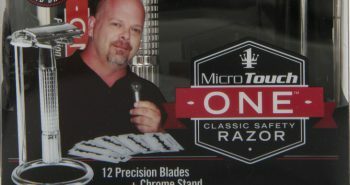 Five floating blades provide the best shave possible. There’s even a handy pop up trimmer, to get into those really tight spots. The Panasonic men’s shaver will let you use it wet or dry, so you can get the best shave possible. It can be used with water, shaving gel, or shaving foam, and is 100% waterproof. This electric shaver has a unique LED screen, so you can tell your shaver settings at a glance. It features ten different stages of battery charge. There’s also a convenient switch-lock button, so your shaver won’t accidentally turn on while in transit. The Panasonic shaver holds a solid charge right to the end, so there’s no drag, and no tugging or pulling of hair. This shaver will maintain a steady charge right to the end. There’s also a sonic vibration cleaning mode so you can quickly clean your Panasonic electric shaver without much effort required. As with any charger in this class, a handy cleaning and charging system storage unit both provides a hygienic cleansing process for the shaver, and lubricating and drying the unit next, and charging it up when the cleansing process has finished. Some of the other chargers on the market need to be cleansed with alcohol, but the Panasonic electric shaver comes with an alcohol-free solution to remove dirt and debris. The shaver can also be quickly rinsed under running tap water, as it’s 100% waterproof. Each Panasonic Multi-Flex shaver comes with its own cleansing and charging unit, and convenient travel pouch. Optional accessories include replaceable foils and blades, so that you won’t need to buy an entirely new shaver when they get dull. 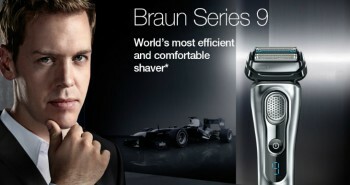 The Braun CoolTec men’s shaver is cordless and rechargeable, and also includes a Clean and Renew system. 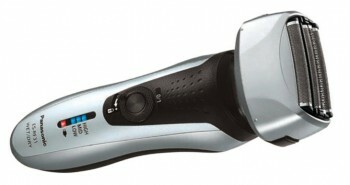 If you don’t prefer a lot of frills, this shaver has a simple foil-head shape in grey and blue. But one notable difference that you won’t see in any other manufacturer is the Braun Cooltec, which is a special cooling technology to keep both shaver and face cool as you shave. The cooling technology in the shaver actually works while the shaver is in the ON mode. The internal technology actually cools and soothes the skin while you shave. This is accomplished with a special cooling bar that is made from aluminum. Moisture will condense on this cooling bar as the skin’s water content decreases. This provides for less skin tension. This is what cools the skin while you’re shaving. It helps to minimize redness, burning, and skin irritation through a reduced perception of warmth. 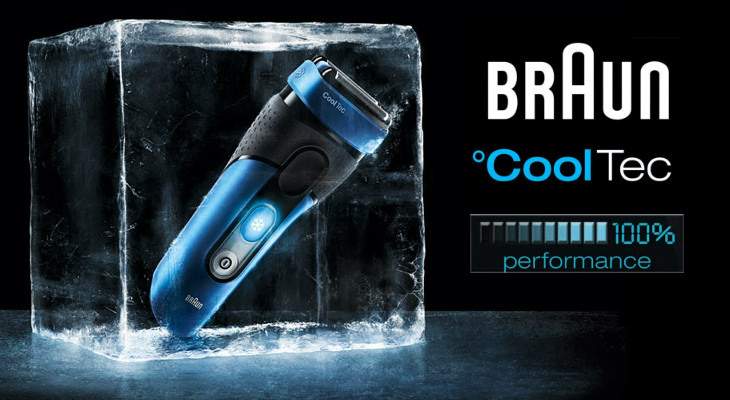 The Braun CoolTec shaver can be used wet or dry as it’s completely cordless. You can either use the Clean and Renew system, or simply rinse it under the tap after shaving. Built within the foils is a three stage cutting system. Each of these three cutter lengths works independently of each other, so that more hair is removed in one pass. There is also the SensoBlade technology that snips off hairs, even when they are lying in different directions, or flat against the skin. 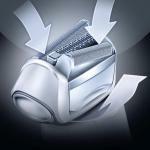 To use the Clean and Renew system, you simply place your shaver head down into the unit and touch the button. It will automatically clean, lubricate, and charge up your shaver so it’s ready for the next morning’s shave. This unit takes cartridges that provide a fresh clean lemon scent, and is alcohol based. This guarantees to remove at least 99.99% of all germs. Using the Clean and Renew system can actually make your shaver ten times more hygienic than simply rinsing it under a tap. At the back of the shaver is a precision long hair trimmer. You can use this to trim longer hairs on your face. It’s good for maintenance of sideburns, beard, or moustache. To figure out how much battery status you have left, you simply look at the LED display that’s right under the CoolTec button—or snowflake. This will tell you how much battery power you have left, as well as if it needs to be charged up, and whether it needs to be cleaned. It works with a powerful lithium icon battery. It takes only one hour to fully get it charged up. This will give you forty-five minutes of shaving time. Inside your box you’ll receive one Braun CoolTec shaver, the Clean and Renew system, one cleaning cartridge in a fresh lemon scent, the charging cradle, a travel pouch, a SmartPlug, and a cleaning brush. If you want a simple foil-style shaver but still want the cleaning station that removes almost all germs, the Braun CoolTec Men’s Shaving System is worth buying. 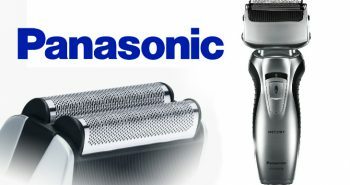 The Panasonic ES8243A Arc4 Electric Razor for Men stands out with its grey and blue styling. This is a foil-style shaver with four rows of cutting elements. They’re angled at a 30 degree angle for the best shave ever. You’ll find that this shaver feels solid and durable in your hands. This shaver is cordless and rechargeable. This makes it useful for dry or wet shaving as it’s 100% waterproof. You can also add shaving gels and creams. You can shave at the sink, or bring it into the shower with you. It’s a shaver for men who are happy with simply giving it a quick rinse under the tap when they’re done shaving, rather than using a separate clean and charge station that increases the price. 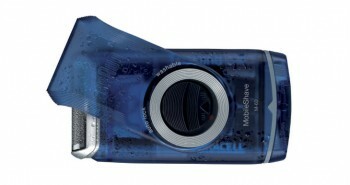 You can also switch this shaver to sonic vibration mode which will make cleanup much simpler. Simply activate it as you rinse your shaver under the tap. 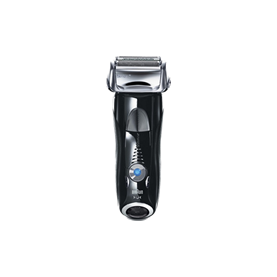 The head of the Panasonic ES8243A Arc4 shaver is installed on a narrow neck to the main body, making it flexible so it can pivot. This enables it to conform nicely to your facial contours, especially around face, chin, neck, and jawline. If you’ve preferred a rotary-style shaver over the years, but decided to try a foil-style, you’ll appreciate how you can also shave in circular motions with this shaver, as well as sideways, and up and down. 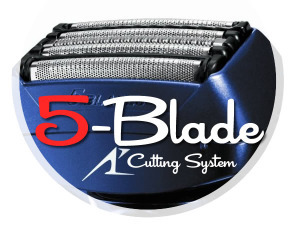 The blades built into this shaver are ultra-sharp Arc4 NanotechTM blades that have been designed to work quickly and efficiently, and to also provide maximum comfort. These four blades each move gently with the contours of a man’s face. This provides for a nice close shave with the best results. The on button is an oval grey shape on the middle of the shaver, with an orange LED display on the front button. This panel shows ten different stages in the battery power. 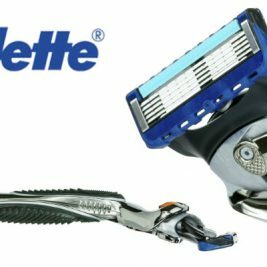 This shaver has been designed with a high-performance linear drive that delivers 13,000 cuts per minute. It will retain peak power up until the end of its charging life. This gives you safe and effective shaving no matter if you have an hour left, or only minutes. 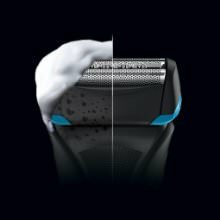 When compared to other shavers of only 10,000 cpm, the Arc4 runs at nearly 1.5 times faster, with twice the cutting force. 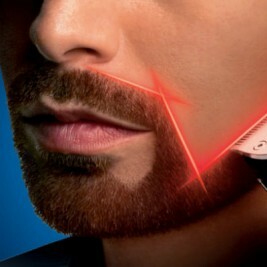 The shaver also has a pop-up trimmer that can be used for more intricate shaving around moustache, sideburns, or beard. To keep the shaver in peak operating condition for the years ahead, the blades and foil can both be replaced from around one to two years, as they can become dull over time. 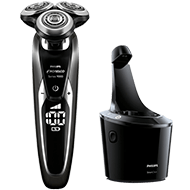 In the Panasonic ES8243A Arc4 kit you’ll get one Panasonic ES8243A Arc4 shaver, a cord, and a travel pouch. This shaver was made in Japan. 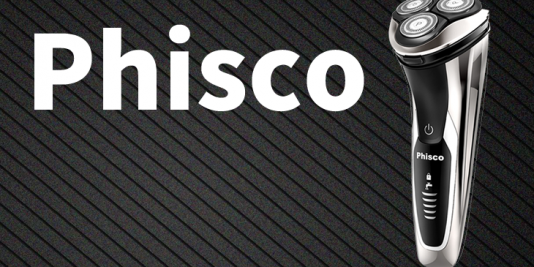 If you’re looking for a basic foil-style shaver that’s both affordable and effective, the Panasonic ES8243A Arc4 Electric Shaver for Men will suit your lifestyle. Some men prefer a rotary-style shaver over the foil type. 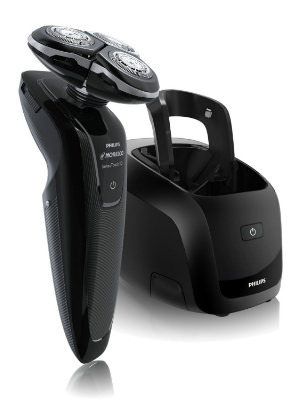 The Philips Norelco 1250X/42 SensoTouch is a premium type of electric, cordless, and rechargeable shaver in black, with accompanying Jet Clean System. This shaver can be used both wet and dry. 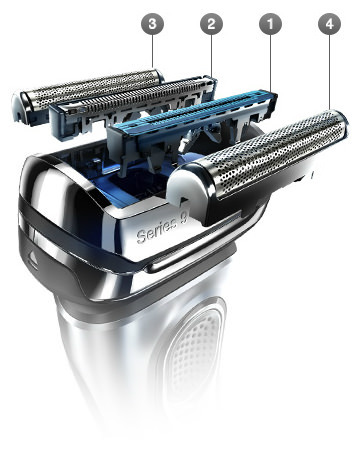 The three smaller rotary heads in this shaver are installed on a flexible neck that moves in all directions. This 3D GyroFlex contouring allows the shaver to adapt to the contours of your face. Shaving happens much faster, and the special channels can easily snip off the longer hairs, while the slots catch the normal hairs. The holes in the shaver head will smooth off that short stubble. The SensoTouch 3D will adjust seamlessly to the curves of your face and neck. Pressure and irritation will be minimized. The three parts in the neck move outward, inward, and pivot around, all to reach the natural contours of your face. The handle of the shaver has a nonslip grip so you won’t drop it in the sink or the shower. This also keeps your hand comfortable, even after two minutes of shaving. 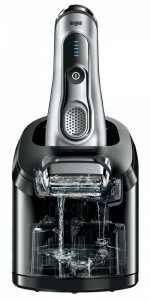 Included with the Philips Norelco 1250X/42 SensoTouch is a Jet Clean system. 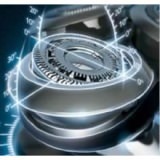 You simply place your shaver’s rotary head down into the unit and press the button. The unit will clean, lubricate, and charge up your electric shaver. This shaver also comes with a convenient trimmer, so you can also trim your moustache, goatee, or side burns. This shaver has a built-in internal lithium ion battery that allows for portable and cordless operation. You can pack your shaver in your luggage and take it anywhere with you. It takes about one hour to fully charge up. This will give you about 50 minutes of shaving time, or about seventeen days, before you need to charge it up again. This is also a good length of time for when you travel, but don’t want to pack extra things like cord or Jet Clean system. To ensure that your Philips Norelco 1250X/42 SensoTouch doesn’t turn on while you’re travelling, you can enable the travel lock. But if you do want to bring the charger cord with you, the shaver does adapt from 100 volts to 240 volts AC, so you can bring it on your international travel trips. There is also a handy LED indicator that will tell you how much power remains in the battery. It’ll also let you know when you need to replace the blades. Besides the shaver and the Jet Clean system, you’ll also get a protective travel pouch to keep the rotary head of your shaver secure in your bag. Instead of shaving up or down, such as with a traditional foil head shaver, you use your rotary shaver in circles. 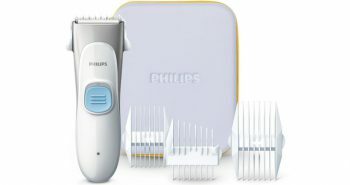 If you prefer the convenience and flex-head of a rotary-style shaver, you’ll appreciate how the Philips Norelco 1250X/42 SensoTouch gives you a smooth and clean shave every morning. Overall, these three shavers are rated in this order. Each electric shaver offers a similar cleaning and charging unit, so I wouldn’t base my selection on that criteria alone. As you can read in our electric shaver reviews all three shavers provide an exceptional shaving experience. 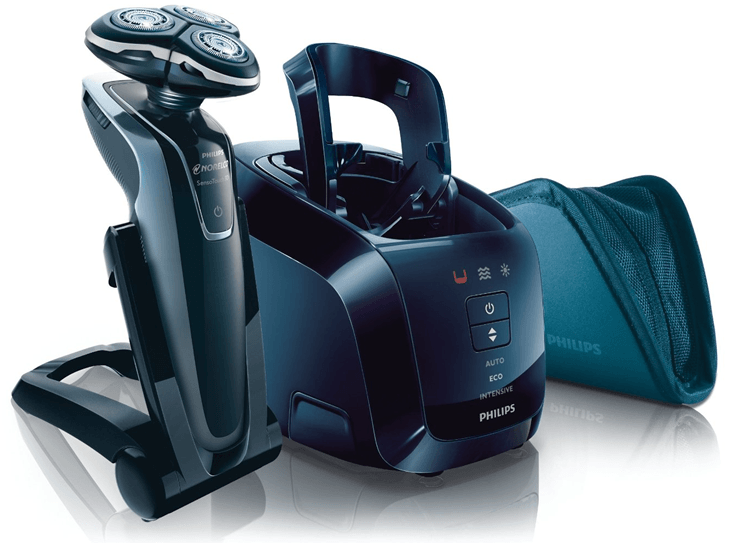 The Philips Senso-Touch 3D Gyroflex shape provided an easier shaving experience. The Braun Series 9 maybe better than Series 7, but with its higher price, unfortunately I can’t recommend it for the highest spot, but it is depend on your budget. For those budget-conscious folks, I’d go with the Braun Series 7, as it also did a perfect job of shaving, and you can’t beat it’s nifty five minute charging option. The older men’s electric shaver did not involve using soap, water, or shaving cream in order to use it, like conventional hand held razor blades did. Originally, men had to deal with a long electrical cord in order to use their shaver, so they had to avoid using them around the sink, in case of electrical shock. Today, the best electric shavers contain a rechargeable built-in battery pack so the shaver doesn’t need an inconvenient cord dragging from the end. The electric shaver can be stowed away on a battery charging unit for next time. This also means that these shavers can be used around the sink, and men can safely shave with water, shaving cream, and shaving lotion, all without suffering from electrical shock. Electric razors may have the traditional oscillating blade design or they can have three rotating rotary heads, but both cut off the hair neatly, as each hair brushes against the top of the razor head. There are techniques that can be used to get a closer shave, similar to a handheld razor, so it’s best to read the instructions included with the product. There are also special moisturizers designed to be used with the electric shavers listed below, which can allow a closer shave. The best electric shavers on the market today are designed for either wet or dry usage. While it’s not recommended that they be submerged in water, they can safely be used over wet skin, allowing a closer shave. 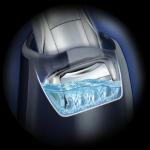 The heads of the shaver can also be rinsed under running water, allowing an easier method of cleaning. Braun, Panasonic, and Philips, all make some of the best electric shavers for men on the market today. Each company offers a line of electric shavers with different features at different price points. 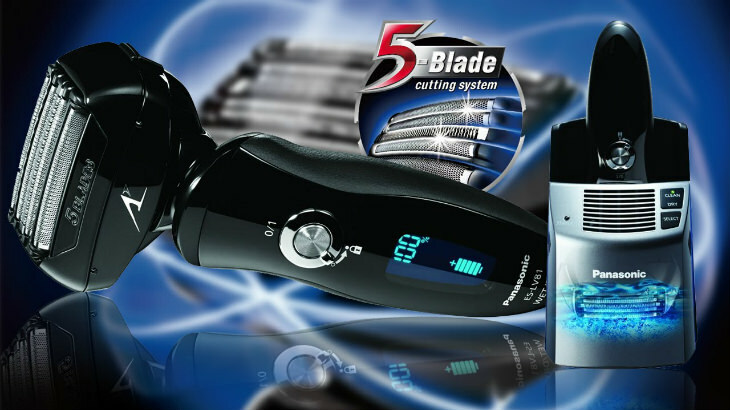 The more features an electric shaver has, the higher the price you can be expected to pay. If you just want an inexpensive unit with an electrical cord attached, they may be harder to find, but can still be purchased if you wish. Most new electric shavers incorporate the latest shaving technology, so when it’s time to replace your old worn electric shaver, you’ll be sure to get excited about what’s on offer now. Additional accessories such as cleaning machines, charging units, brushes, blade technology and storage cases will also increase the worth of an electric shaver. Each manufacturer constantly improves their hair cutting mechanism, so technological improvements are made each year. Electric shavers are designed to give you several years of good usage, and most electric shavers come with replaceable foils and cutting blades, so you can get many more years of usage out of them, without having to toss them away. For more details, read our deep electric shaver reviews categorized by brands, types and price range.